Stunning. Consuming. Poetic. Raw. Heartrendingly Beautiful. 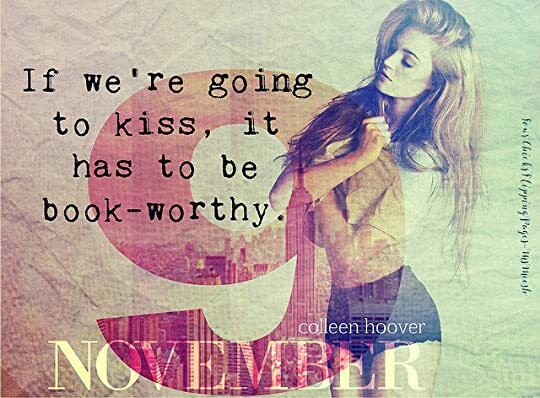 These are a few words that comes to mind when describing this magnificent and captivating masterpiece called November 9 by Colleen Hoover. CoHo is one of those rare authors who DELIVERS every single time. If her mission was to grip her readers hearts and leave a stain on our soul with her written words then I will happily say mission accomplished. She delivered. Well, she more than DELIVERED as readers like myself happily handed my heart to her as she took me on one of the most unforgettable reads that I have read. One date. November 9. One day out of 365 days in the year. That one specific date that CoHo has ingrained in her readers. The date that readers like myself will fall in love with the story of Benton James Kessler and Fallon O'Neill. November 9. In life, there are so many momentousness occasions and life-altering dates that occurs in one's life whether it be a birthday, a milestone, a graduation, a wedding, a death anniversary, or the day that will forever alter and change your life. For Fallon O'Neill, November 9 marked the day that changed her. It is the day that left her insecure and ridden with physical scars. But on that specific day, November 9 also marked the date that she met Benton James Kessler. On November 9, Benton James Kessler walked into Fallon O' Neill's life and instantly knew his life would be forever altered by this girl. He didn't see a young woman with physical scars but instead saw a witty, smart, funny and beautiful girl. A girl who just needed that extra push of encouragement to be bold and confident. He saw that her inner beauty radiated from within and that her scars were just as beautiful. It told him that this girl he just met was a fighter and survivor. They say ever scar tells a story. And for Fallon, her scars tells of a story that will emotionally gut you. Her scars were a reminder of a terrible accident gone wrong and a resentment she holds. These scares were put on display of what could have been a thriving career as a young actress in Hollywood. But all that changes, when Ben made her see that she doesn't have to hide her scars. Ben knocked down her walls of insecurities and stripped her bare, allowing her to see that Fallon O'Neill is one of the most beautiful woman that walked into his life. And on that day, November 9 marked the day when a boy fell in love with a girl. The day that gave birth to an epic love story. I really don't want to say anymore because November 9 is a book that must be read, experienced and savored. I will just say this Colleen Hoover reminded me once again why I love reading her books. She has a way of stripping you down, laying you bare and exposed in order to FEEL for her characters. Passion, strength, humor, hope, absolution, and love were so beautifully entangled and woven into this book that I was left breathless as I absorb every written word and emotion. Did Colleen Hoover leave me a blubbering mess? Yes, of course she did. She is Colleen Hoover, a master in pulling those emotional heartstrings. With that being said, I will just say CoHo will shatter your hearts as she weaves one of the most emotional plot twist that will have you grabbing for the tissues. But don't worry and fret too long, CoHo will heal and mend our broken hearts with her magical and book-worthy unforgettable lines. Just be prepared to fall in love Benton James Kessler as he writes and tells us why his love for Fallon O'Neill is book-worthy. Colleen Hoover is one those gifted and rare writers who can capture your hearts with her gorgeous prose and raw characters. Like any masterpiece, Colleen Hoover paints a beautiful literary creation that will leave a lasting impression that can stain your soul. Her words are not only felt but absorbed. 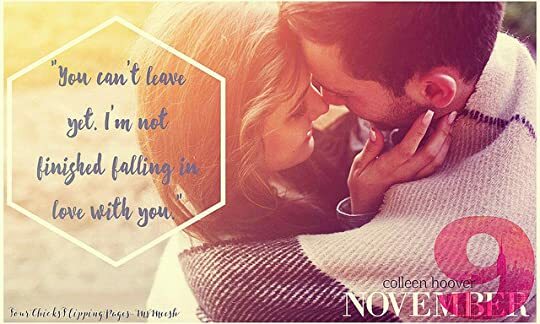 It is often said to let the work speak for itself and as such Colleen Hoover will hold you hostage as you are immersed with beauty, loss, friendship, heartache, and a new found sense of hope, absolution, finding oneself, and an epic book-worthy love. November 9 was a book that consumed you, stripped you naked and left you feeling raw, exposed and vulnerable and it was worth every laughter, tears, and swoon-worthy moments. As an avid reader, I love to read book to escape. To fall in love with the words, the characters, and everything in between. Just a few pages in, you can already tell if a book is going to be amazing or not. And let me just say, November Nine is 100% BOOK WORTHY!!!!! So thank you, Colleen Hoover, for gifting your readers on another unforgettable book worthy romance!!!! Gut–wrenching story of Ben and Fallon. A beautiful and heartbreaking story of two people finding love at a very bad time in their lives. A slow burn of the story, that took a while for the climax to come. But once the story progresses, it not only pulled me in, made me fall in love, but also broke my heart over and over. Ben and Fallon goes through so much together and separately and even thought they only got to see each other one day every year, they never forgot each other. Do you believe in Soul Mates? That is one question that Ben had asked Fallon and anyone that reads this story, will definitely answer that question with a yes. Time and time again, Fallon and Ben made me fall and in out of love with their story. Of course I cannot forget about Ben, I am in love with him. He is funny, sweet and very smart. With every scene he is in, he had me wrapped around his fingers. He was a guy with so much to give and deserved so much love. Anyone that reads this story will definitely fall in love with Ben. The ending was beautiful, but it ended abruptly. I wish there was an epilogue, that gives us so much more of Ben and Fallon. They deserved so much more than a quick ending. Oh please Ms Colleen Hoover right a Novella.